I have already bought my "Step Outside Posh Boy" t-shirt. Go here for the new strategy. 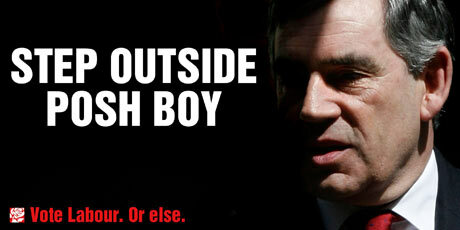 I seem to be one of the few people in the UK that are actually rather fond of Gordon Brown. An April Fool's I presume. But funny nonetheless. Me too, Stephen. Best PM in a long time. April fool yes but the t shirts are real. If GB keeps spouting brainless kack like this, you might want to re-think your fondness for him. Aside from the substance of what he says, which I'm willing to shrug off as political pablum, I must ask: How frickin' tone-deaf to the moment at hand must a politician be to applaud "the Catholic communion" - not just UK citizens who belong to the Church, but the institution itself - for acting as "the conscience of our country"? WTF? Very good - I'd be tempted to buy the T-shirt myself if I didn't think it'd be misinterpreted as an anti-Labour statement. I've got purely selfish reasons to be fond of Gordon Brown - I started work and started a family under the Tories and remember waking up to the fact that we'd have been better off on the dole (because it cost money to work - e.g. in travel - but every penny you earned came straight off your benefits). Then Tax Credits came in and suddenly we could actually think about buying a house, taking holidays, and generally having some quality of life. It infuriates me to hear people reeling out the 'all parties are the same line' now... the Tories' idea of educational opportunity in my home town was to cream off the top 50 kids every year and send them to the local public school, dumping the rest in an underfunded 'comprehensive' (= secondary modern). My kids now attend an actual comprehensive - one that (horrors!) everyone's allowed to go to - which was built from scratch two years ago and which makes the 'posh' school I attended look like a garden shed. Just show how quickly people start taking things for granted I guess - or maybe people with younger kids now just don't realise what things used to be like, or higher earners don't realize (or don't care) how much the lives of us 'little people' have improved under Labour. Not looking forward to getting the Tories back though. Hee hee... this is worth a chuckle! - is a video called 'Checkmate, Atheists'. Poor old DM seemingly hasn't noticed that it's a rather mirthsome *parody* of crappy Christian arguments, taking the piss out of people exactly like him. Or maybe DM is a joke character himself? Either way, thanks DM - cheered me up! "atheists deny their own life element... "
Perhaps it's worth setting up some temporary moderation till he buggers off? Yeah, DM hit Atheist Missionary recently too, to the sound of much lulz. Also, it appears you have been hit by a Labour spambot too. By the Boulder Pledge, I now may not vote Labour. Oh well. Not a Labour spambot - a debt lawyer spambot that's latched on to some of the money-worries language in one of my posts and started quoting me with a link attached. Sorry! Oh, I see. Sorry about that, Greg. How do I stop all these "best attorney" things (other than deleting em one by one) - anyone know?